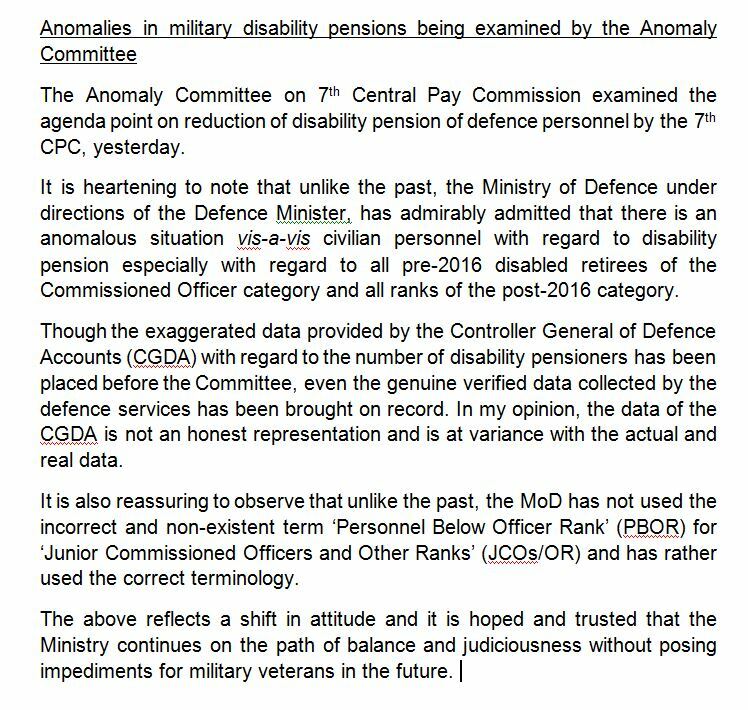 Thanks to @manoharparrikar, MoD has taken a genuine stand in the Anomaly Committee examining issues related to military disability pensions. Eagarly awaiting, Government decision will favourable to faujis. Lot of thanks thanks of Maj Navdeep Singh who always keep his eye on Defence Welfare. Apprecietable. Hony Naib Sub Bachan Singh, ur client too. Action must be taken against Bureaucrats who always put wrong info against forces to avoid their benefits. Thanks Sir. Most of the ORs sustained injury at young age and disabled will be drawing service pension below 20000 and slab system is beneficial to these needy people. Those who draw above 20000 service pension and drawing disability among ORs monitory lose in slab system is marginal. Those who draw one element less must get benefit from other element. So, slab system systems suits better for majority of ORs. There is nothing in nomenclature, what is needed is treat the ORs in a decent way while on service or after discharge. Stop separate Q for officers in ECHS. No officer will support this. Since officers did not get benefit from disability inc pc, they stoped benefit given to ORs also. Real hurdle is not govt, but our own ex-bosses. This thing never happens with civilian retirees. It is defence officers who treat JCO/OR with a mentality 'you are below me'as in varna system and they never feel JCO/OR is a subordinate in a disciplined organisation. Now blaming persons sitting in MoD for nomenclature is baseless. Now also for the benefit of officers, Govt is forced to refer the issue of DP to Anamoly committee, not for the benefit of lower ranks who left the service with disability at young age.Slab system is beneficial for lower ranks who were released with disability at young age. Only assurance from govt needed is rate prescribed in slab to be revised as and when OROP revision takes place. For Anonymouses. Pension to be revisied by 2019 as per 7 CPC scale. So percentage basis fit for JCOs/ORS. Almost on all forums find PBORS or anonymous named moles disguised have single minded agenda against officers and break unity. Many of our veteran brothers from ranks get sucked into this easy derision and the government ploy. We find hardly any meaningful contributions and / or written expressions with logic & numbers from the affluent & well settled counterparts in corporate from this very PBOR community but always ready find a dividing wedge as if IAS and allied services bosses give them golden bricks. Else in last 70 yrs this country should have been Singapore / Japan or Germany. Its time to dissolve this so called fauj and generate a new outfit on lines with our existing Police / CPAF who would abandon posts like recently in Haryana , Kashmir , Uttarakhand deluge & many such in past 70 yrs. Hope later this country will be able to rebuild again a force which will be self charged , motivated and self wille to sacrifice their lives because they get a government salary or someone talked of mercenaries. Yet to find the secret where a school , curriculum and training can motivate one to dedicate or sacrifice one's life but ready to destroy an institution very close to it.